To clarify the meaning of monochromatic dressing, it is using one color in different shades or the same shade from head to toe. (Mono=one, chromatic=color) This is one of the easiest ways of dressing and always looks chic & well put together. For day four of NYFW I wanted a more relaxed casual look. I went for an over sized sweatshirt dress,thigh high boots and a distressed denim jacket. One of this season’s hottest trends from the 90’s has made it’s way back in a big way. It was all over the runways in just about every version you can imagine . If you’re not a huge velvet fan but would like to add a touch into your wardrobe, a fool proof way is in your accessories. Here I spiced up my NYFW look for day 1 with thigh high navy crushed velvet boots and my brand new platinum locks. Pairing this type of boot with an oversized pinstripe tunic immediately made the look more relaxed. This summer I spent a couple months exploring the Philippines. I was based in Manila for most of the time but explored El Nido ,Palawan ,Puerto Princesa and Boracay which are coming to the blog in later posts. 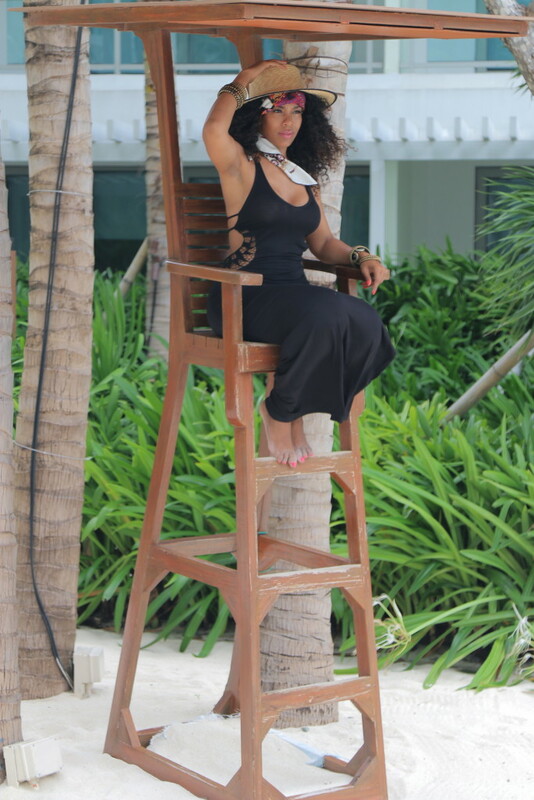 Here I’m playing lifeguard (ok ok just for 2 mins while I did this shoot lol) but nevertheless still was really cool sitting up there in this gorgeous maxi dress .